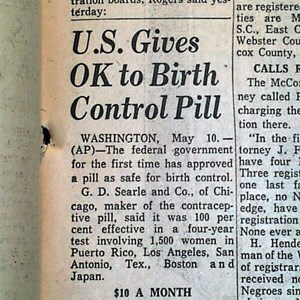 The Food and Drug Administration (FDA) approves the world’s first commercially produced birth-control bill–Enovid-10, made by the G.D. Searle Company of Chicago, Illinois. Development of “the pill,” as it became popularly known, was initially commissioned by birth-control pioneer Margaret Sanger and funded by heiress Katherine McCormick. Sanger, who opened the first birth-control clinic in the United States in 1916, hoped to encourage the development of a more practical and effective alternative to contraceptives that were in use at the time. In the early 1950s, Gregory Pincus, a biochemist at the Worcester Foundation for Experimental Biology, and John Rock, a gynecologist at Harvard Medical School, began work on a birth-control pill. Clinical tests of the pill, which used synthetic progesterone and estrogen to repress ovulation in women, were initiated in 1954. On May 9, 1960, the FDA approved the pill, granting greater reproductive freedom to American women.